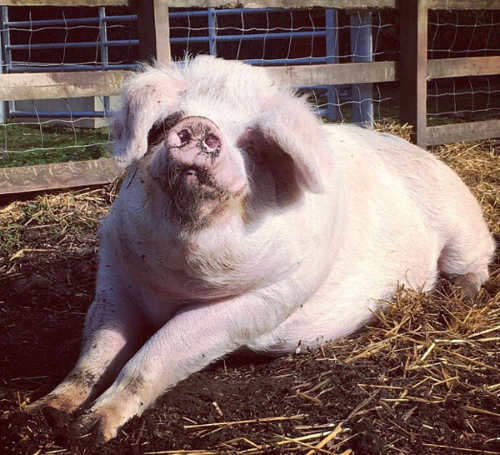 It’s not often that we have to give sad news at the farm, so it is with extremely heavy hearts that we must announce that Margery, our Gloucestershire Old Spot pig has passed. What a charismatic and beautiful lady she was. She was the first big animal you would see if you arrived on the yard in the morning before turnout (or on a wet day as she hated the rain and would not go out), and the last you would see at the end of the day. She delighted everyone that met her with her pink slippery snout, blond eyelashes, squeaks and grunts and fondness for having her soft pink tummy tickled for as long as you could muster. In the Autumn of last year, she was diagnosed by our two independent vets as having arthritis in her back legs and hips. It is a common condition in pigs of her size and age. We hoped that with the arrival of Spring and Summer she would overcome her symptoms and have a brighter outlook for a time. However, even after being medicated and having daily exercise to keep her joints moving, she was obviously still feeling the effects, even during the amazing weather of late. With all of these factors in mind and her increasing awareness of her aches and pains, we were advised that it was time to spare her any further discomfort and indignity. We hope as supporters and friends of the farm that you can appreciate what a hard decision this was for us to make as a team. We felt we should make this announcement because we know that she was loved by so many of you. Daniel Fletcher is one of our young farmers, and went to collect Margery when he was twelve with our retired Stockman John Langan in 2012. 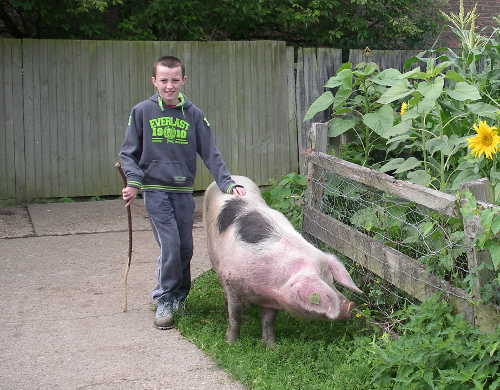 He had been coming to the farm every weekend since he was eight years old, and is now almost eighteen and has just started an apprenticeship with us. He wanted to talk about his memories of Margery. We will all miss her and the yard will not be the same without her presence, but we hope that the arrival of two new piglets will give everyone a smile after the sadness of losing our dear old Margey Girl.